Whether you're a Writer looking to check your work or a Beta Reader who wants to point out a few things to your favorite writer, feel free to borrow, spindle, and mutilate this list of questions to your heart's desire. Have you hugged your Beta Reader today? Whether you’re a Writer looking to check your work or a Beta Reader who wants to point out a few things to your favorite writer, feel free to borrow, spindle, and mutilate this list of questions to your heart’s desire. Are their parts that you skipped to get to ‘the good part’? If someone unfamiliar with this Fandom read this, have I explained enough for them to understand everything? -- Did I forget to mention that someone was demon-possessed, half angelic, or had mystical powers? -- Was your Comfort-Zone line crossed? Did the actions & positions flow smoothly from one to the next, or did they jump as though something was skipped? Were the Flashbacks smoothly integrated to fit onto the current scene -- or did they seem plopped in, like a chapter that was in the wrong place? Can you SEE every action clearly? Could you SEE what the characters looked like clearly? Could someone who was Not familiar with the fandom SEE what the characters looked like clearly? -- Did I forget to describe their Clothes, their Hair, their Eyes, any other distinctive feature that pertains to a specific character? Do the characters ACT realistic? Do their reactions seem logical & realistic? Did the characters seem In Character? Would Original characters have worked better? Does any one character get in the way of the STORY? 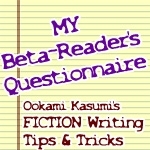 The answers to these burning questions will keep your fiction crisp, focused and Popular. If your Beta readers liked it then loads of other people will too.